I was looking for a controller and I've noticed Retro-bit sells "replicas" (licensed by Sega) of the saturn and megadrive controllers (there are versions working on pc). The reviews seemed quite positive, and I've pre-ordered a saturn pad (they're not yet available in my region). It was just in case anyone is interested. I'll be looking forward to your impressions, I saw many good reviews as well. I saw plenty people on here talk about the M30 8Bitdo ones, but noone is talking these Retrobit recreations. I have ordered 2x Mega Drive (Blue and black) (MD), 1x Mega Drive (black) (USB) and 1x Saturn (black) (USB). I will probably order more if the quality is satisfactory. The controllers have been in the hands of Youtubers for quite a while now. There is something odd going on with their public release. Amazon canceled orders for many of the pre-order customers. Every single one of my orders was canceled even though I placed them within an hour of them being available. My order through Castle games seems fine but they don't have stock yet. The above may be a good alternative. I can't find a way for free shipping but their controller costs are a bit below Castle. The Genesis controllers have been available on eBay for at least a week, and the Saturn ones from one seller since Friday. I got a Genesis one from Amazon not long ago for MiSTer. Have not had a chance to try it but it feels great and adds shoulder buttons for a better all-around pad. How's the action on those shoulder buttons? I'd love to hear some opinions on these too. Same here, I'm really torn between the mega drive and saturn one. Shoulder buttons are short-travel and clicky (but not obnoxious). Less travel than Saturn pad. The MD ones are priced just a bit lower, FWIW. Sounds good. My preferred seller is dragging his feet on getting the USB Saturn version up for sale, grrrrr. The MD controller has the extra mode button which might be important for some. I assume it will work like a select button on a PC/PS3. On the other hand I think the Saturn will have the better shoulder buttons since this controller was modeled around these buttons originally. The 6button MD pad had the mode button where the R button is located on most controllers, but this mode button was never intended to be used frequently during gameplay. So it’s neat if Retro-bits added shoulder buttons work well enough, but the shape of the controller was never designed for these. The added Genesis shoulder buttons look as good as they could, given as you say that nothing was originally intended to be placed there (at least for actual play use). They definitely have a more functional look than the original Mode button did. Maybe this will pleasantly surprise you. I admit that I've grown on the Mega Drive 3 button pad and I personally love it do death. I've then migrated to the mega drive 6 button pad (because street fighter 2) and I really liked it as well, although I still prefer the 3 button version. I didn't have a Saturn back then, got a japanese white one some years ago along with its original pad and I didn't have much time with it but it felt "okay" to me. I could pull supers and combos in Alpha3 without issues. As of now, I'm more inclined to get the mega drive one with shoulder buttons, but I really want to hear more opinions, especially on the shoulder buttons. Personally, I never liked the use of tact switches on the Saturn buttons. Didn't feel as functional to me as regular rubber membranes, and clashed with the feel of all the other buttons on the pad. The switches on all the reissue pads were, without a doubt, much too firm and harsh to have been chosen for gameplay buttons. Maybe RB have gone to membranes here either for practical reasons or as an attempt to improve the one weak area of the pad. Imagine if they did actually manage to do something better than on the originals.. looking forward to finding out. Fantastic! Please keep us updated, I'm really interested in both, especially the MD one. The only game I know of that needs the mode button is Golden Axe II. If you start up the game without holding Mode then the game becomes unplayable due the controller not functioning properly. My Amazon order has been delayed. I'm not really expecting to get my hands on it anymore. Got the USB controllers today. The Saturn controller is a disappointment. The Mega Drive one seems alright. On both controllers the D-pad is slightly wrong compared to the originals. You can press all directions down by pressing in the middle, (like the SLS USB pad to be fair). I can imagine that this would be a problem for those who presses too hard on their controllers. It's not a problem for me, and the Mega Drive controller felt fine during my playthrough of Persona 4 Arena. The Saturn on the other hand does not. The left and right directions are fine, but down is noticeable stiffer and up is somewhere in between. This hasn't caused any wrong inputs, but it definitely doesn't feel like a Saturn controller is supposed to. The shoulder buttons on the Saturn controller is the worst of all the kinds I own. In order I would rank them OG Saturn > PS2 Saturn > SLS USB Saturn and Retro-bit in last place. I'll open them up later, but I suspect that they have replaced the tact switches with rubber dome buttons. They certainly feel that way. What's worse is that the R button feels ever so slightly less responsive than the L one does. Though to be fair they have worked every single time I pressed them during gameplay with no fault. They just feel off. The shoulder buttons on the MD controller are alright and better than I expected. They are very "clicky" and seems to activate properly no matter where you press them, though they seem to pivot near the top, so they feel a little different there (think Z button on GameCube, but nowhere near as noticeable). The face buttons on both controllers are excellent. I only have the smaller JAP MD6 button controller to compare with, and the buttons are a tiny bit looser on that one, but that may just be down to wear and tear. The Saturn ones feel exactly like the originals. I can only speak for the USB versions, but I can't imagine that the console versions are any different. 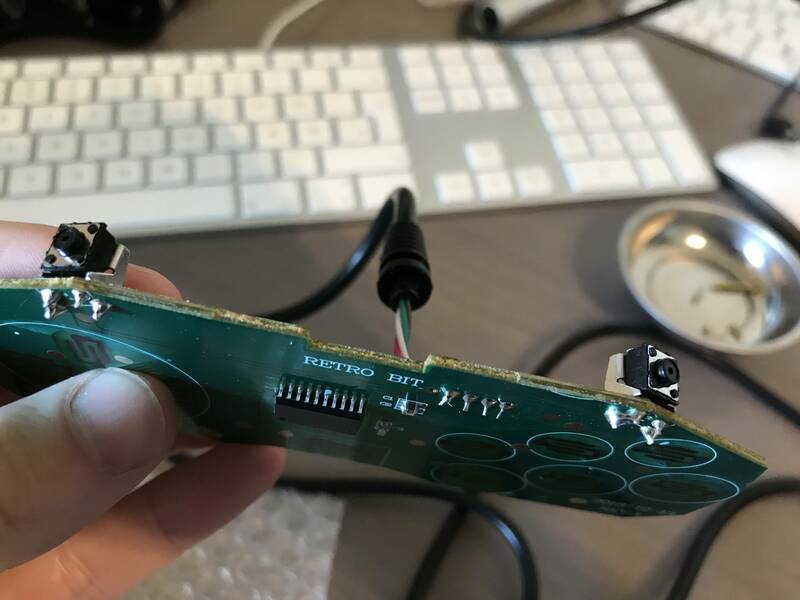 I've only tested on the PS3, and the button mapping is completely nuts so a soldering iron is absolutely required so you can fix this mess yourself! Maybe just pass on the Saturn controllers entirely? As said the MD ones seem quite good, and I expect that the one for MD consoles will work great as I assume it has the proper button mapping... We'll see when I get mine. I've watched several of the YouTube influencers impression videos on these things, and I'm baffled that they didn't pick up on any of these criticisms. Are they really so stoked about getting free stuff for promoting that they don't think before putting up their videos? At least how stupid the button mapping is should have been disclosed long ago! Removing the excess plastic on the up position is easy enough. But the bend part may not be so easy. I'll have to pull out my hot air station to see if it can be restored. Last edited by Konsolkongen on Mon Apr 15, 2019 7:00 pm, edited 5 times in total. Thank you Konsolkongen for that amazing review. I can't believe they'd mess up the most basic essential aspect of the d-pad. I guess I'll be skipping these unless they make an announcement that they will improve the product. As I expect can't take youtube reviews seriously, they get the stuff for free and are not likely to offer proper criticism where it's due. 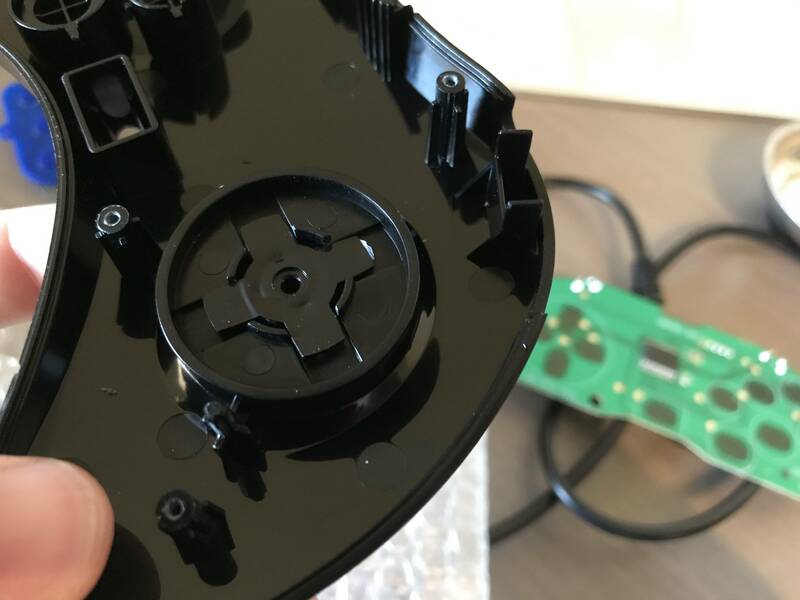 I have managed to improve the Saturn D-pad by quite a lot by cutting off that excess plastic and heating it a bit. Need more testing before I can determine if it's good enough or needs further improvement. I also corrected their horrible button layout by resoldering the connections on the board. I haven't been able to fix the R trigger yet. Not sure if that's possible. I could see the D-pad being a one time manufacturing fault on my controller. If that's the case I suppose I could give them a pass on the Saturn controller, though the R trigger is a bit disappointing, but the blame could be put on the tact switch manufacturer I guess. The button mapping annoys me to no end, but to be fair it was never made for PS3. It might be easier on PC to configure this stuff? I'm still getting the two MD controllers for the original system, so it will be interesting if there are any variations in the molding on the D-pad activator inside. Hmm. Very disappointing but not surprising coming from someone who actually knows what they're talking about. Still, I cannot believe there are so many glowing reviews from so many people and not ONE can pick up on details better. I will still be getting one Saturn USB pad to see for myself, probably not for a little while. I'll update as well whenever that may be. That's a shame about the dpad. I was really looking forward to these controllers. I do like my 8bitdo m30 though.